New officers were officially sworn in and recent promotions were celebrated during an April 4 ceremony. Back row, left to right, are Capts. Paul Smith and Keith McCabe, Sgts. Jarod Ewers, Jordan Reese, Casey Justice, Josh Smith and John Terry, and Assistant Chief Ed Turas. Front row, left to right, are Maurice Taylor, Kristopher Burkhart, Andrew Mosteller, Noel Santoyo and Jameelah Stephens. 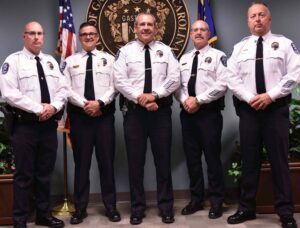 Gastonia Police Chief Robert Helton and Assistant Chief Travis Brittain with new Assistant Chief Ed Turas and new Capts. Paul Smith and Keith McCabe. Pictured, left to right, are McCabe, Brittain, Helton, Turas and Smith. 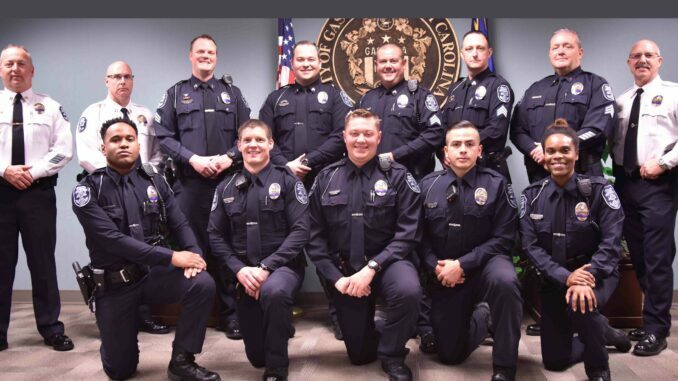 Gastonia Police celebrated eight promotions, and five recently hired officers were sworn in during a ceremony on April 4 in the police department’s community room. Capt. Edward Turas was promoted to assistant chief effective upon the retirement of Assistant Chief Mike Smith on Jan. 1. Turas is a 21-year veteran with the Gastonia Police Department. He has commanded the Patrol Division, Criminal Investigations Division, Special Investigations Division, Administrative Services Budget and Finance, and the Special Situations Unit (SWAT and the Bomb Squad). Turas serves as a professor of Criminal Justice Studies at Gardner-Webb University and Gaston College, and as a research program director for the University of North Carolina at Charlotte. He holds a bachelor’s degree in creative arts from UNC-Charlotte, and a master’s degree in justice administration from Methodist University. He is a graduate of the FBI National Academy, the FBI and U.S. Army Hazardous Devices School, West Point Leadership Program, and the Chamber of Commerce’s Leadership Gaston. Turas’ community activities include serving as chairman of the Human Trafficking Workgroup-Gaston, as a board member with the Gaston Controlled Substance Coalition, and coordinator of the Pink Patch Project. His memberships include the International Association of Chiefs of Police, the NC Police Executives Association, the Society of Police Futures International, and the International Association of Bomb Technicians and Investigators. Sgt. Keith McCabe was promoted to Central District Patrol captain in January and also commands the Shift Tactical Unit. 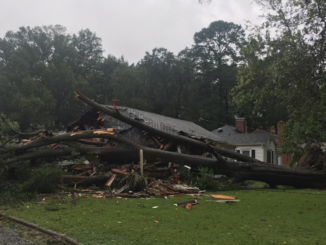 McCabe is an 18-year veteran with the GPD and his assignments have included Patrol, Police Training Officer, Detective and the department’s Training Officer. He was promoted to Patrol sergeant in 2008, and transferred to the Traffic Enforcement Bureau in 2013 where he served for six years. McCabe holds an associate degree in Emergency Medical Science from Catawba Valley Community College, a bachelor’s degree in business from Montreat College, and master’s degree in business from Pfeiffer University. He is a state and nationally registered paramedic. He is a Sergeant First Class in the U.S. Army Reserves and serves as an instructor for the Advanced Leadership Course out of Fort Knox, Ky.
Paul Smith has been promoted to East District Patrol captain and is commander of the Special Situations Unit. Crime Prevention, K-9 and Traffic are also under his supervision. Smith is a 24-year veteran of the GPD and has had many duties and assignments, providing assistance to the entire department and the Chief’s office. He has served in Patrol, Crime Scene Investigations, SWAT, as Police Training Officer and Police Training Officer Sergeant, and as a shift investigator and shift sniper. As Administrative Sergeant for 10 years, Smith served as Range Master, Dive Team Commander, and SWAT Advisor. He’s a state certified instructor. He holds an associate degree from Gaston College and a bachelor’s degree from the University of Mount Olive. Sgt. Casey Justice was hired in June 2011 and has served with the Patrol Division. In June 2016, he became a K-9 handler on the nightshift with many tracks, apprehensions and arrests. He holds a bachelor’s degree from UNC-Charlotte. Sgt. Jarod Ewers was hired in July 2009 and served in West District Patrol until being transferred to Traffic in October 2013. He holds a bachelor’s degree from Lenoir-Rhyne University and many certifications. Sgt. John Terry was hired in January 2001 and assigned to the Patrol Division until 2005 when he was transferred to the Street Crime Unit. He was assigned to the Special Investigations Unit in May 2006, and served as a sworn Task Force Officer with Alcohol Tobacco Firearms & Explosives from 2007 – 2018. 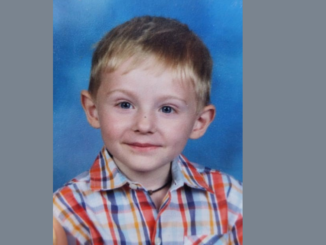 He was a member of the Bomb Squad for six years. He holds an associate degree from Gaston College. Sgt. Jordan Reese was hired in July 2011 and served with Patrol for more than five years before being assigned to CSI for two years. He served as a sniper for three years and currently serves with the Honor Guard, the Shift Tactical Unit and as a Gang Intelligence Liaison. He holds an associate degree from Gaston College. Sgt. Josh Smith was hired in December 2010 and has served as a Police Training Officer and Shift Tactical Officer since 2012. He has served as a shift sniper since 2017, the Honor Guard since 2018 and has served with GPD’s Recruitment Team. He holds a bachelor’s degree from Appalachian State University, and a master’s degree from University of the Rockies. Kristopher Burkhart was hired on July 30, 2018. He holds an associate degree from NC State Agricultural Institute and completed the Basic Law Enforcement Training (BLET) program at Gaston College in December 2018. Andrew Mosteller was hired on Nov. 6, 2018. He holds a bachelor’s degree from Appalachian State University and completed BLET at Gaston College in December 2018. Noel Santoyo was hired on July 30, 2018. He has an associate degree from the Community College of the Air Force and he completed BLET at Gaston College in December 2018. Noel serves in the U.S. Air Force. Jameelah Stephens was hired on June 4, 2018. She holds a bachelor’s degree from Monmouth University, a master’s degree from Walden University and completed BLET at Gaston College in December 2018. Maurice Taylor was hired on July 16, 2018 after serving as a police officer for two years with Oak Harbor, WA. He has an associate degree and bachelor’s degree from Embry Riddle Aeronautical University and completed BLET at Gaston College in December 2018.